Digital to Analog Converters, or DACs, convert digital signals back to analog signals, typically in the form of an analog voltage or current. Most signals are more easily stored, processed or transmitted while in the digital domain after having been converted using an Analog to Digital Converter. However these signals often need to be converted back to the analog domain - using a D/A Converter - to allow for human interface. Common types of D to A Converters include Sigma-Delta DAC, Successive-Approximation DAC, R-2R Ladder D/A Converter and Oversampling Digital to Analog Converters. Critical performance parameters for these components are Resolution - normally expressed in bits - Total Harmonic Distortion + Noise (THD+N) - expressed as a percentage - and Max Sampling rate - usually expressed in MSPS. Digital to Analog Converters are widely used in a broad range of applications where a human-machine interface exists. 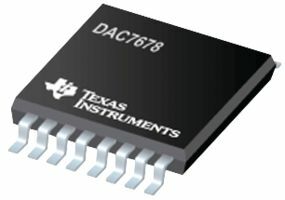 DACs are commonly found in audio and video processing systems, medical and laboratory equipment, test and measurement equipment and telecommunications systems. Manufacturers of Digital to Analog Converters include Analog Devices, Maxim Integrated, Texas Instruments, Linear Technology, Intersil, Datel, Holtek Semiconductor, Wolfson Microelectronics and Asahi Kasei Microsystems. Procure International offers both current production and obsolete D to A Converters from most of the world’s manufacturers at very competitive prices and short lead times. Search for the Digital to Analog Converters you need using the Part Number Search bar at the top of this page, submit your RFQ to get pricing, and place your order directly online using our secure online ordering process.